Women's Anti-Aging Face Cream 50 ml / 1.7 fl. oz. 1- a protective shield against damaging environmental agents. 3- lifting express, working on two levels, facial expressions are relaxed but wrinkles and facial lines are instantly smoothed. And the secret to this 24-hour global skin care? 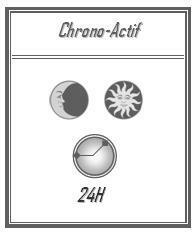 LACRÈM Surgical Research has developed chronobiologie, a compound that delivers total skin-care, day and night for up to 24 hours. The cream also continues to work and adapt depending on the time of day. Skin cells perform different functions between day and night; during the day, the skin prioritizes its protective functions acting against UV light, pollution and stress; at night, the skin prioritizes skin cell renewal. 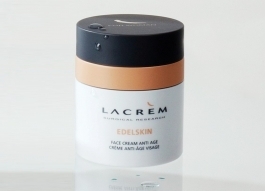 Anti-age Face Cream enhances all the skin’s functions from protection to cell renewal. Enhanced cell renewal and microcirculation promote a skin that is more radiant and hydrated. This intelligent emulsion, a true ally for the skin, uses a technology called Chrono-Actif that allows it to respond to the specific skin care needs during the 24-hour day. - a purified extract of sunflower coupled with edelweiss to protect the cells from UV light and sunrays that cause severe skin damage. - Formulated with micro algae, a 3D band smoothes the skin instantly, the face is shielded and wrinkles and expression lines are visibly reduced. - the water lily flower soothes irritations due to the stresses of the day facilitating a fresh and invigorated skin upon waking. - when the skin is hydrated, the restructuring amino acids can better penetrate to improve the cellular renewal and reinforce the underlying supportive tissues of the skin. Apply the anti-age cream on a perfectly cleansed and toned skin. To reinforce the anti-wrinkle effect of the product, apply the serum complex before the anti-age cream.